"Hi I'm Lee Fellows. Our Renewable Energy and Green Technology division began in 2011. 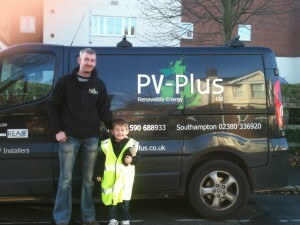 Myself and Adrian Summers created PV Plus. Myself a qualified electrician with over 20 years experience and Adrian a property developer with years of successful projects under his belt! Our enthusiasm for green technology began while working for Protean, a research and development company for the electric car. It was clear that renewable and green energies was the future and we wanted to be part of it. We did our research, under went some pretty intense training to ensure we could be MCS accredited and began PV Plus. Since 2011 we have been part of some amazing projects and met some amazing people. Our projects have included fire stations, offices, schools, farms, barns, hotels, houses and nurseries. Most of our work is generated through word of mouth and I am happy to say our reputation for customer satisfaction is outstanding. We work hard to ensure every customer is happy from start to finish and are always on hand after completion." " Hi I'm Adrian Summers. Almansa Construction Ltd was established in 1996 as a property developer primarily involved in the construction of new build character properties in the local area. 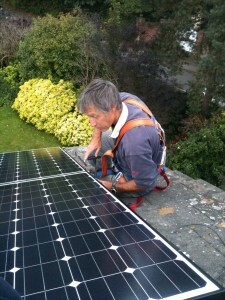 Due to building regulations now requiring a ‘greener energy’ construction, Almansa Construction saw an opening in the market place to supply and fit PV solar panels and consequently teamed up with Lee Fellows, who owned a local electrical company with vast experience in both the domestic and commercial industry , to form PV Plus Ltd.
We have worked on exciting projects all over England. One of my favourite must have been the 50w system we installed on the Chicken Farm. Apart from the noise (and the smell) this was a great site, we had a fantastic finish and the customers were so impressed that they asked for another 50w to be installed on their other barn. Not to mention the fresh eggs we given! But all in all thats what we like - happy customers"